Don't believe what you read! 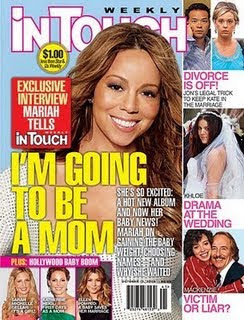 Mariah, like many young ladies, may have had a pregnancy scare. But she is not, I repeat, NOT pregnant. But I think I can speak for Mariah when I say that when our butterfly does spawn her cacoon, she is going to be rocking some fierce maternity clothes and her feet gone be all swole in dem stilletos!